Experience a fun-filled celebration of friendship in the beloved Pooh tradition with this special 10th anniversary edition of The Tigger Movie. Share the excitement with all your friends from the Hundred Acre Wood as Tigger sets off on an amazing adventure. He s hoping to find fellow tiggers to play with, and along the way, he'll discover something even more remarkable: the true meaning of family. Featuring original songs by the award-winning Sherman Brothers (Mary Poppins), plus two new-to-DVD Tigger stories, this timeless Pooh classic will bounce its way straight into your heart. $9.427 million on 2723 screens. What's the difference between a "direct-to-video" (DTV) film like The Little Mermaid II: Return to the Sea or Pocahontas II: Voyage to a New World and The Tigger Movie? There isn't much of one, except the latter actually made a theatrical appearance in February 2000. Other than that, Tigger bears the mark of most of the DTV presentations in that it was produced by one of Disney's TV animation units and doesn't live up to the high level of quality usually found in their "classic" titles. However, that shouldn't mean that Tigger isn't worth a look, as the movie's actually a mildly entertaining piece. The story follows standard Disney "inspirational" fare. Although he used to think the best thing about Tiggers is he's the only one, Tig now starts to feel rather alone and he decides to seek out his family. A mass attempt ensues, and some confusion makes a mess. Eventually, Tigger realizes the inevitable: Pooh, Piglet, and the others are his family, even if they're biologically not Tiggers. Technically I suppose I should have warned you that potential spoilers appeared in that last paragraph, but if knowledge of the film's ending actually affects your enjoyment of Tigger, you need to get out more. Tig's "revelation" about the true definition of a family can be seen a hundred acres away, but the predictability doesn't really bother me. After all, how many Disney films provide any kind of real surprises? As with lots of other films, the fun comes from the execution, not from twists and turns of the plot. In that regard, Tigger is a moderate success. It's certainly not a classic Disney offering by any stretch of the imagination, but it only pursues modest goals, and it generally achieves them. One area in which it mildly excelled came from its songs. The film used new tunes from famed Disney music-writers the Sherman brothers; they were responsible for the ditties in films like Mary Poppins. The new tunes aren't classics, but they're more interesting than the usual dreck we hear in these lower-budget Disney productions, and the musical numbers featured in the film are occasionally pretty entertaining; for example, Tigger's show-stopper "Round My Family Tree" positively recalls Aladdin's "Friend Like Me". Other parts of the production are better than expected as well. Though completed by one of Disney's TV animation arms - apparently the Japanese crew did this film - the artwork flows more smoothly than usual for this semi-bargain fare. 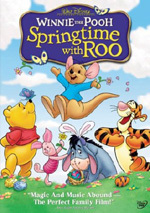 The characters and settings look accurate to the original cartoons (the original Disney styles, that is, not those shown in AA Milne's books), and the motion seems relatively fluid. It doesn't match up more sophisticated movies from Disney, but at least it succeeds fairly well, unlike some of the other TV animation-created pictures. Overall, The Tigger Movie defines the phrase "modest entertainment". The film shoots for small goals and achieves them in an acceptably enjoyable manner. All aspects of the picture are reasonably well-executed and the tale provides a quietly entertaining experience. It ain't art, but it'll do. 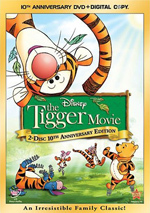 The Tigger Movie appears in an aspect ratio of approximately 1.66:1 on this single-sided, double-layered DVD; the image has been enhanced for 16X9 televisions. I thought the transfer looked quite good. Sharpness seemed positive. Wider shots could appear a little soft, but not to a terrible degree. Most of the movie showed nice clarity and delineation. Moiré effects and jagged edges looked absent, and I witnessed no edge enhancement. As for print flaws, I saw a handful of tiny blemishes but nothing significant. Colors seemed lovely, with some bright and accurate hues throughout the film. The movie's palette tended toward fall colors, which were lush and rich; between this element and Tigger's fur, orange dominated the proceedings, and these tones appeared precise and clear. Black levels were deep and dense, with fine contrast, and shadow detail looked clean and smooth; low-light situations were depicted cleanly and with excellent delineation. The Tigger Movie provided a fine viewing experience. The film's Dolby Digital 5.1 soundtrack seemed solid as well. The forward soundstage appeared very active, with a high level of discrete audio emanating from the side channels; effects, music, and even a little dialogue came from the right and left speakers, all of which helped created a nicely-broad spectrum of sound. The surround channels seemed less active as they tended to stick to ambient music and effects. However, at times they came to life nicely, especially during the snowstorm toward the end of the film; the wind and other nature sounds swirled about effectively. Audio quality seemed fine at all times. Dialogue appeared crisp and distinct, with good intelligibility throughout the film and no signs of edginess or dullness. Effects were clean and accurate and they displayed no distortion; even during louder scenes like the snowstorm, these elements remained clear and realistic. The music appeared smooth and bright, with some moderate low end as well; the songs were nicely musical and bouncy. Dynamic range wasn't a standout aspect of the mix, but the track seemed fairly brisk and it showed decent bass at times, whether through rumbling effects or in the songs. Ultimately, it was a somewhat modest soundtrack but it appeared more than adequate for the material at hand. How did the picture and audio of this “10th Anniversary Edition” compare with those of the original 2000 release? Unfortunately, I was unable to dig up a copy of the old disc and directly compare the two, but I expect that both are very similar. I’m sure the audio remains the same, and I’d be surprised if the visuals offered any differences. That does mean that there’ll be a discrepancy between the “B+” I gave this one’s picture and the “A” I awarded the 2000 DVD. I didn’t think it seemed right to alter my old review if I couldn’t watch the earlier disc, but keep in mind that what looked great to me in 2000 won’t necessarily dazzle me in 2009. For one, I used a 27” 4X3 set back then and I now view on a 50” 16X9 screen, so flaws will be much more obvious. In addition, I’ve gotten spoiled by Blu-ray over the last few months, which means that SD-DVDs usually seem blah by comparison. Indeed, I was pleased at how well the visuals of Tigger held up given those caveats. I think it’s likely that the 2009 DVD looks at least as good as the 2000 release. A few supplements flesh out the set, and most of them repeat from the original 2000 DVD. I’ll mark new extras with an asterisk, so if you fail to see a star, the component showed up on the old disc. We get a 16-question trivia game that was standard for early 21st century Disney DVDs. It poses queries about the movie that are pretty simple for anyone who's seen the film. If you get them all correct, you then are allowed to watch an 80-second featurette about the origins of Pooh and his friends plus how they came to the big screen. Obviously, it's a pretty superficial program, and it honestly isn't worth the effort if you don't want to play the trivia game anyway. A second game appears on the DVD. Called the Thingamajigger Matching Game, this features three rounds, each of which poses about six questions. 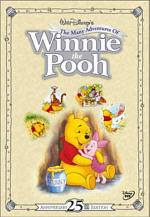 For example, you may be shown four objects and you have to choose which belongs to Pooh. It's simple but actually kind of fun. Unfortunately, you get no "reward" ala the trivia game if you answer all the problems correctly. Round Your Family Tree offers kids simple directions to create their own family trees. It's basic but makes a nice educational tool for little ones. 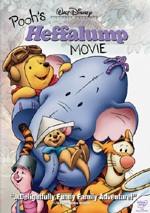 The DVD Storybook allows children to read a text version of Tigger. As always, one can choose to follow the story with or without narration. In addition to the film's theatrical trailer, a couple of musical features appear. We get the music video for Kenny Loggins' "Your Heart Will Lead You Home". The song is perfectly atrocious - though pairing "perfectly atrocious" and "Kenny Loggins" is redundant - and the video dull; it follows the usual "lip-synch/film clip" motif and is perfectly boring. The "Round My Family Tree" Sing-Along is exactly what the title describes; it allows viewers to do their karaoke best along with the aforementioned tune. Two *bonus episodes of The New Adventures of Winnie the Pooh appear. We get “King of the Beasties” and “Tigger’s Houseguest”. Both focus on Tigger, which makes sense given their placement on this disc. The shows offer decent entertainment, though neither proves to be especially memorable. A few ads open the DVD. We get promos for Snow White and the Seven Dwarfs, Tigger and Pooh and a Musical Too, Mickey Mouse Clubhouse: Mickey’s Adventures in Wonderland, Ponyo and Disney Movie Rewards. These also appear in the Sneak Peeks area along with clips for The Princess and the Frog, Tinker Bell and the Lost Treasure, Little Einsteins: Flight of the Instrument Fairies and Handy Manny. A second disc provides a *Digital Copy of The Tigger Movie. It allows you to plop the movie onto your computer or portable viewing device. If that works for you, party down! While it doesn’t qualify as one of Disney's all-time great films, The Tigger Movie is more "success" than "failure". It never attempts to be anything other than a cute little story about the real nature of family, and it provides a moderately endearing program. The DVD offers very good picture sound plus a few extras. The Tigger Movie won't make you forget any of Disney's real classics, but it's a fun little experience nonetheless. I doubt that fans who own the original 2000 DVD will feel a need to upgrade to the 10th Anniversary set, though. I think both probably offer similar picture and audio, and the new release does little to improve the supplements found on the 2000 release. This is a decent package but not worth a double dip.